One of the minor tragedies that stems from the loss of Shake-speare’s true identity is the loss of his contribution to Christmas and other modern year-end traditions. What would this time be without the Stage? Without the Stage we would do without The Nutcracker, La Boheme, and Die Fledermaus; without the The Christmas Carol, It’s a Wonderful Life, Miracle on 34th Street. Greatest of all would be the loss of holiday plays at schools that bring kids, parents and teachers together once a year as members of a community. Who among us is aware that it was “Shake-speare” who created the Stage that spread from England to Northern Europe, or that he created it first as a Christmas entertainment? For, were the truth to be told, or perhaps told in such a way that the world could hear it, he would be seen in his eternal role as the very king of Christmas, its Oberon, its Hobby Horse, Green Man, Lord of Misrule, Abbot of Unreason, King of the Bean. For little Edward de Vere, isolated from his patrician family and probably also from any meaningful relationship with other boys his own age, there was one time in the year when the official dole of porridge and Latin aphorisms by his penurious tutor was interrupted in joyous fashion. This would have been the annual celebration of Christmas at Windsor Castle, just up the river from Smith’s Ankerwycke, an event that not even the most stiff-necked Protestant ex-cabinet minister would have dared to ignore. We can be certain that what Mary Tudor provided for her Court community, including their children, was as extravagant and exciting as she could make it. Recalling the happy days of her own childhood at the Court of young Henry VIII, as Queen she now had the power to recreate the kind of extravaganzas provided by her father in the full flush of his pleasure-loving youth. Thrilling to the little five, six, and seven-year-old would have been the music that played throughout the day (Smith had no ear for music), the great candlabras so extravagant with candlelight that the descent of night at 50 degrees north latitude, sometime in the late afternoon, was postponed until well after midnight. Enraptured by the music, the elaborate feasting, the dancing, the perfumes, the clowns and puppet shows, and not least, some precious moments with the parents that he never saw at any other time, to fall asleep surrounded by a dozen or more other happy children, was a pleasure, once experienced, eagerly anticipated for the rest of the year. What a blow it must have been then, when suddenly, probably without warning, he found himself sent away the winter of his ninth year to spend the holidays alone in a cold and unfamiliar room at Queens’ College with none but strangers to attend him while Smith was off in London trying (and failing) to get chosen for a post on the new Queen’s privy council. Following their return to Hill Hall in April of 1559, it’s questionable whether there were any more trips to Court for the holidays. It would have been a long haul over icey roads from northern Essex to Whitehall in London, which is where it seems the new Queen preferred to keep Christmas. Since the ancient traditions were frowned upon as either too Catholic or too pagan by the reformers who had put her in office, Smith, no longer an inside member of the Court community, would more likely have kept the holiday at his new home in northern Essex in the subdued fashion that as Justice of the Peace and enforcer of the Protestant Service that he had helped to create, was now not only his duty but was always his personal preference. Small wonder then that once Oxford got his bearings in London at twelve, the budding genius would seek ways to bring the joy he had felt as a child to a household and a Court where Calvinism cast its cold, unforgiving shadow over every form of ancient merry-making. Though the Queen herself was not averse to having fun, she was definitely averse to spending money on anything she didn’t have to. From the start she found other means of entertaining her community than through the lavish expenditures of her father and sister on pageant wagons and expensively costumed masques. Court payment records reveal the increasing involvment of the Children’s Companies in the Royal Christmas, primarily through the boys whose high-pitched voices provided the soprano parts for the choir at St. Paul’s Cathedral, a choir she knew well from services at the Cathedral during her years as a princess. Under the expert direction of choirmaster Sebastian Westcott, the boys, whose duties under Queen Mary had been primarily devotional, found approval by including witty dialogues, known as interludes, written for them presumably by Westcott, though we can’t be certain. Soon it appears that interludes began expanding into full length plays. Although the few titles recorded give rare clues as to their content, what hints there are suggest an author with a strong interest in history, classical literature, and a hunger for love. While theater historians choose to read into this that such interests were common at Court at that time, we know of one who, though young, plus an unusual gift for poetry had been given a profound education in these very themes. With the holiday season of 1567-68, just before Oxford turned eighteen, the scribe whose job it was to keep a record of the Queen’s entertainments happened to include some of the titles, two of which suggest our author: Orestes (or Horestes), which is, as it happens, still extant and, as Sears and Caruana detail (1989), written in the same style as his early poems, and The King of Scots, which, though no longer extant, could very well be an early version of Macbeth, since the subject of Scotland was uppermost at the English Court at that time, Darnley’s murder still fresh in everyone’s mind. At some point in the early years of Elizabeth’s reign, plays written for Paul’s Boys to perform during the winter holidays at Court began migrating to the public, enacted by the boys within the same structure where they lived within the cathedral complex, part of which it seems had been recently converted into a stage. Though apparently open to the elements at the rear, it seems the stage and part or all of the audience were protected from the weather by the overhanging cathedral cloister. Westcott made a good living in his position within the Church, so altogether the boys were probably well treated. They were also privy to one of the finest grammar school eductions of the time, the Paul’s grammar school. It was in this way that the public first began getting access to plays that were being performed at Court during the Christmas holidays. Starved for years-end entertainment by the Reformation, the response from the public was such that highly-placed couriers began to consider creating a venue for a Crown-based company, one located as close to Westminster and Whitehall as possible. Immediately following Oxford’s return from Italy, such a venue was created under the guise of a rehearsal hall for the Children of the Queen’s Chapel, brought closer to the posh West End by creating space for them in the old Revels complex in the Liberty of Blackfriars, just within the City Wall. The first years at Blackfriars (1577-1580) went easily enough, or at least, so far as the record reports. But shortly before Oxford was banished from Court, troubles arose, money got so tight that Master Farrant was forced to rent part of the space, something his lease forbade without the landlord’s permission, which gave said landlord the reason he’d been looking for to get the children, or their theatrical enterprise at least, ousted from the premises. Farrant then complicated the situation further by dying just before the winter holiday season in 1580. In the confusion that followed, Oxford’s name appears again in the record, as the lease to the Blackfriars Theater passed briefly into his hands, ending finally with Lord Hunsdon, who, a decade later, will establish Shakespeare’s company, the Lord Chamberlain’s Men. More clues to Oxford’s involvement are to be found in the record of payments and the Court calendar where titles were recorded. In 1576-77, the first winter season following his return from Italy, titles like Error, short for Comedy of Errors, or Titus and Gissipus, a possible scribal mistake for Titus Andronicus, were both performed by Paul’s Boys. That season the Lord Admiral’s Men performed The Solitary Knight, possibly Timon of Athens, while Sussex’s Men performed The Cynocephali (The Dogfaced Men), a story that would resurface decades later as one of the tales with which Othello woos Desdemona. Oxford’s involvement with the Court Stage is also suggested by the appearance of his name in the records as patron of a boys company for the holiday season of 1582-83, the year it was suffering from the loss of Westcott, who had died the previous April. It seems that the scribe, needing a name for the children’s company that was now without its master, reverted to the patron that he knew, probably at first hand, as most involved in producing entertainments for the Court. Since Oxford was not around that year, exiled by his seduction of Ann Vavasor, this appearance of his name suggests that had he been present he would have seen to it that the scribe used a different name. In 1584-85 a company the scribe calls “Oxford’s Boys” performed Agamemnon and Ulysses, a title that strongly suggests an early version of Troilus and Cressida. These are just a few of the hints that Oxford was providing plays for both the boy companies and the adult companies from late in the 1560s through the middle of the 1580s. Who were Oxford’s Men and Oxford’s Boys? It may be that by the 1590s Oxford’s name had become a resource that did not necessarily have anything to do with whether or not that company performed his plays. The name and the plays had become separate commodities. The plays that belonged to the Lord Chamberlain/King’s Men, plays written for the Court, could not be published under his name, leaving the name itself free to be used by one or more companies that required a patron (though no more than one at a time). Thus it’s possible that some of the older boys who lost their positions as actors when Paul’s Boys lost its place at Court in 1590, may have formed a company of their own that performed at the Boars Head Theater along with Worcester’s Men, officially joining that company in 1602.
Who maintains ’em? how are they escoted? Will they pursue the quality [acting] no longer than they can sing? Will they not say afterwards, if they should grow themselves to common players––as it is most like, if their means are no better––their writers do them wrong, to make them exclaim against their own succession? Evidence that Oxford was the primary founder of the London Stage comes from the fact that it was within weeks of his return from Italy in the Spring of 1576 that Burbage’s great Theatre went up in Shoreditch, and while that was busy entertaining the public throughout the summer, plans were in progress to provide the Court with a training ground for the boys of the Queen’s Chapel to rehearse the plays they would be providing for Her Majesty’s “solace” that holiday season by, not just the Children of the Queen’s Chapel but by a company combined of both Chapels, Greenwich and Windsor. This was the season when titles appear in the record of Court performances that suggest his authorship, titles like Error, Titus and Gissipus, The Solitary Knight, and The Cynocephali. It was Lawrence Stone, author of The Crisis of the Aristocracy (1964), first to cast Oxford as the aristocratic whipping boy for the Marxist-Socialist English historians of the mid-20th century. While making himself foolish with his theories regarding the imaginary decline of the English aristocracy during Elizabeth and James’s reign, one of Stone’s more obvious gaffes is his explanation for the influx of wealthy English into London for the winter holidays as stemming from their desire to buy luxury items and ride around in coaches, when so obviously it was then, as it still is today, the existence of the just-created London Stage that brought them to London to see the plays that before the London theaters were built, would have been enjoyed only by the lucky few who were able to see them at Court. Did anyone see the BBC series “The Hollow Crown” on PBS? If so, what did you think of it? Unfortunately I missed the first two, Richard II and Henry IV Part One, but did manage to see a fair amount of 2HIV and Henry V. “Fair amount” since sleep, which generally overcomes me shortly after 9 PM, took me captive, despite the charms of Tom Hiddleston as Prince Hal. What did I miss? From what I saw I thought both productions were good in some ways, but truly terrible in others. The good was largely Hiddleston as the prince. A product of Eton and Cambridge where he majored in Classics, he has a princely accent and attitude, a wide range of expression, and is the right age for the character. Moving easily from moody pensiveness to rage to hilarity, he finds in Hal the depth of character and range of emotion that are the hallmarks of Shakespeare’s greatest characters. This carries him through the complexity of the speeches––though some could have used cutting: I cringed to think that, as King, Hal would have kept the Mayor of Harfleur on his knees through that long pompous threat of what would happen to babes and daughters if the Mayor refused to yield the town. But we must remember that this is very early Shakespeare. Jeremy Irons is a good Henry IV; the action is interesting and well-conceived, the camera-work expressive and unobtrusive, and the costumes remarkable for achieving a blend of period authenticity and what a modern viewer can relate to, at least for the courtiers. Unhappily however, this last does not extend to the inhabitants and setting of the Boars Head Tavern, for what’s truly awful about this production––and recent film versions as well––is the way Falstaff and his friends are portrayed as the scum of the earth, dirty, disheveled, dressed in rags, hanging about in a filthy tavern overseen by a slovenly madam who keeps a company whore even more ragged and slatternly than she. Most awful is what this bucket-load of grunge has done to the image of Falstaff that has accrued over the centuries. Here is the blurb with which Sparknotes online promotes the series: “A fat, cheerful, witty, aging criminal, [Falstaff] has long been Prince Hal’s mentor and close friend. He pretended to have killed Hotspur at the Battle of Shrewsbury, and Prince Hal–the actual killer–agreed to go along with the lie. For this reason, everyone gives Falstaff much more respect than he deserves.” Obviously this is what the author of this blurb has gotten from watching the series––Falstaff is a criminal and Hal is a killer! Why on earth would the Prince of Wales, soon to be crowned as the great Henry the Fifth, choose to spend so much of his time with this unpleasant old rascal, dressed and directed as though he were a drunken Salvation Army Santa Claus. His seedy surroundings, immense bulk, fusty beard, and rapid delivery distract from Shakespeare’s text, which tells a very different tale. Unfortunately the audience, unless it already knows the play, will not find it easy to catch the import of the text, since the current practise of running lines at an unnatural speed in film productions, where action must replace the precision and clarity of a traditional stage performance, turns Falstaff’s wicked tongue and wit to the mutterings of a crazy old fool. The idea that the Prince of Wales would prefer to spend his time in such a setting and with such an “old criminal” is so absurd that the viewing audience is more or less lost from the start. What were the producers thinking? If it was to create a contrast with the Court, that fails, due to two other bad things, namely the dull color palette and the choice of a vast empty hall as the King’s presence chamber. Just about everything in the film, whether in the Court or the Tavern or on the battlefield is either brown, black, or gray; there isn’t a spark of bright color anywhere. Where is the splendor with which the late medieval royalty surrounded itself, the purple, carnation, scarlet, gold and white, the “peach-color” of Poins’s stockings, the sun shining through stained glass windows? Shot in the winter, with the trees bare and the sky gray, the outdoor scenes are just as bleak as those indoors. As for the crew gathered in the Boars Head Tavern, it would seem that modern directors seriously mistake the intense teasing and rude familiarity of people who have no fear of seriously offending each other as the brawling of thieves and streetwalkers. Ignorant of the times, the ambiance they seek to recreate has caused Shakespeare’s meaning to escape them. Why does it never strike them to wonder why Falstaff is so revered? If he’s the shambling old nonentity he’s portrayed, why does the royal prince, with his princely education, desire his company? Why does the hostess of the tavern pressure him to marry her? Why does Doll Tearsheet demonstrate such love for him? How can Falstaff dare to consider himself the Prince’s “true father”? Bereft of the stature and bearing that the text suggests, missing the meaning of the rapid fire delivery, how are we to take Falstaff’s claim that he is not only witty in himself, but is the cause of wit in others? If we pay attention to the text we find that this old stumblebum speaks to those around him with the arrogance and self-importance of a courtier (more notably in Part Two) , an attitude rendered ridiculous here by the seedy setting, his short stature, unkempt hair and undistinguished garb. No more than a knight, where does he get the aristocratic attitude that he deserves to have whatever he wants? Attempting to purchase satin for a suit, he curses the system when told he hasn’t the necessary security (credit). Ignoring the Lord Chief Justice, he invites this high official’s companion, the poet Gower, to dine, despite his obvious inability to pay the bill. Nor is this attributable to a lunatic’s Napoleonic complex, for were he the lowlife he’s portrayed, the Lord Chief Justice would hardly take the time to seek him in person, but would send a constable to fetch him for questioning (about the Gad’s hill robbery). Confronting him, he would hardly waste words in one of Falstaff’s wit battles––he would simply have him arrested. If Falstaff is in fact what his name tells us he is, someone who has carried the staff of high office and who has failed that office, then everything falls into place. It makes sense of Hal’s interest in him. It makes sense of the scene in Part One where, before the battle, Falstaff joins readily in easy conversation with the King. It makes sense of Mistress Quickly’s eagerness to marry him, for, however poor in cash, someone in high office would have estates to support him. If Falstaff doesn’t see to his estates the way he should, that’s another aspect of his failure. It makes sense of Hal and Poins’s devotion, the sort that rebellious youths are often inclined to give a fallen idol. As for Poins, depicted here as only the best of the bad lot that congregate around the depraved Falstaff, as Shakespeare suggests, he’s Hal’s close and intimate friend––if not a peer himself, then close to it. Ned Poins, named for a leading family of the day (usually spelled Poyntz) would not be hanging about in the Tavern, waiting for the Prince to appear, he would accompany him, going and coming. As for Bardoph and Nym, Shakespeare does not intend them to be taken as Falstaff’s equals; it’s clear they are his servants. A captain himself, Ancient Pistol is his sergeant, Peto his lieutenant. All rely on his patronage, however uncertain. Falstaff claims that he “bought” Bardolf at Paul’s Cathedral, where masterless men were known to gather in search of employment. The little page treats Bardolph rudely, like one on his same level. That Falstaff is meant to be elegantly dressed is clear from the comments by Hal and Poins on how Falstaff has turned the page into his “ape,” that is, he has dressed the boy like himself, and has encouraged him to join in the verbal fencing that they call wit. Along with the anomalously huge and empty presence chamber, there’s the anomaly of the Boar’s Head Tavern. Where did the directors of this production get the model for this dilapidated, low-ceilinged dump, tucked behind a battered old door like one of the blind pigs of Prohibition, lacking any touch of decoration or charm. Don’t they bother to read any history at all? The Boars Head Tavern was famous in its time as the finest inn in London. Where is there any evidence of the “plate” and the “tapestry of her dining rooms” that Mistress Quickly fears having to pawn unless Falstaff pays his bill? When she says, protesting the presence of his “swaggering” servant, “I must live among my neighbours: I’ll no swaggerers: I am in good name and fame with the very best,” what could be “the very best” in such a place, and why should her wretched neighbors care, or she care what they think? Of course, there were “stews” in London, neighborhoods where gangsters and their molls held sway (as Robert Greene depicted in his “renunciation” pamphlets), but this would not have been the sort of hostel where one might rub elbows with the Prince of Wales and his friends. When, joking, Falstaff says he’ll get a wife from “the stews,” meaning the slums, would that make sense if his tavern was located in a slum? Would Shakespeare waste the opportunity to adorn Doll Tearsheet with the finest up-to-date attire, or an exaggerated version of it, rather than what the BBC has given us, a beautiful actress made to look worse even than the lowliest streetwalker, who at least would be doing her best to dress in a way that she hoped would attract men. This Doll, her hair uncombed, her colorless dress torn and unmended, qualifies for nothing better than an inmate of Bedlam. What happened to the “fair hot wench in flame-colored taffeta,” with which Hal teases Falstaff? Far from the grungy dive it’s depicted here, the historic Boars Head Inn, located in central London in a neighborhood dominated by the halls of the powerful and wealthy trade guilds, was a classy establishment, probably from the very first. History informs us that it was in the reign of Richard II, shortly before the period of the Henry IV plays, that one William Warder gave a tenement called the “Boar’s Head” in Eastcheap to a college of priests, founded by Sir William Walworth, for the adjoining church of St. Michael’s in Crooked Lane. According to John Stowe, during Shakespeare’s time Eastcheap was “butcher’s row,” where the public houses had the most delectible roast meats to offer, and where, as Mistress Quickly suggests, it was possible to order meat during Lent. Lasting well into the 18th century, the Boar’s Head, that is, the one that replaced Shakespeare’s after it was destroyed in the great London fire, was noted as, “the chief tavern in London,” frequented by the likes of Alexander Pope and his brilliant coterie. As for the historic Falstaff, unable to locate a model in history or literature that fits the Stratford biography, academics usually attribute this greatest of all his comic characters solely to Shakespeare’s imagination, but we heretics have a wider fund to draw on. For instance, since we can accept that Shakespeare was fluent in French, the idea that the relationship between Hal and Falstaff was inspired by the violent and scatalogical wordplay of Rabelais’s Gargantua and Pantagruel––while rejected by the academics because Rabelais wasn’t translated into English until the mid-17th century––works well for us. The first character to play the role of Hal’s quarrelsome foil was Dericke, the clown from the very early play The Famous Victories of Henry the Fifth. Since documentation shows that members of the Queen’s Men, Richard Tarleton and William Knell, played Dericke and Hal respectively, we know that Famous Victories dates back at least to the 1580s (historian Ramon Jiménez puts it as far back as the 1560s). But while Dericke is a standard vice figure left over from medieval times, Falstaff is clearly one of Shakespeare’s departures from tradition. Among these departures was his method of creating important characters by conflating the traits of persons familiar to his Court audience with figures from literature and history. That the Sir John Falstaff of the Henry IV and V plays was originally Sir John Oldcastle is clear from, among a number of other clues, the appearance of “Old” as a character in the sloppily printed 1600 quarto of Henry IV Part Two, the phrase “Old Lad of the Castle” that remains in Henry IV Part One, and the Oldcastle (also known as Jockey) who joins the Gads Hill gang in Famous Victories. Since there is also clear evidence that the Falstaff of Merry Wives was originally the same Sir John Oldcastle, we can assume that both plays were written (rather rewritten) at the same time, and that both saw the character’s name changed from Oldcastle to Falstaff in the mid 1590s (more precisely, late 1596 or early 1597) and for the same reason, because the Queen insisted that it be changed. We have no reason to doubt that Her Majesty (and the entire Court audience), saw Shakespeare’s Oldcastle as a satirical character intended by the actors and their playwright to embarrass their newly-appointed patron, Lord Chamberlain of the Royal Household, William Brooke Lord Cobham. As Alice Lyle-Scoufos demonstrates in convincing detail in her Shakespeare’s Topological Satire (1979), Shakespeare combined damaging traits and events from Cobham’s life (including the true incident of the robbing of the Spanish courier by his sons during Oxford’s time at Cecil House) and the life of his renowned ancestor, Sir John Oldcastle (burnt at the stake as a traitor by Henry V) on purpose to demean Lord Chamberlain Cobham and show his son-in-law, Secretary of State Robert Cecil, that he (Oxford) wasn’t about to be bullied into silence. As a character in the Henry IV and V plays, Sir John Oldcastle is historically accurate. The historic Oldcastle had in fact been a friend to the historic Prince Hal, one who, for reasons of religion, turned on his former friend once he became King. It was Shakespeare’s depiction of Oldcastle as a braggart, liar and thief that was taken by all, including the Queen, as a blow aimed at Cobham, whose appointment to the office of Lord Chamberlain was understood by the actors and their playwright as a means of restraining them from engaging with the parliamentarians due to gather in the West End in the fall of 1597. The truth about the historic John Oldcastle is still a problem for historians since early Crown historians saw him as a heretic traitor while early Reformation historians saw him as a saint, a precursor of the martyrs who inspired the Reformation. Shakespeare obviously preferred the former interpretation. Not only was Cobham the unwanted intruder who, following the death of their original patron, Lord Hunsdon, in 1596, had replaced him, he was the previous owner of the rooms in the Blackfriars that had been the first Blackfriars theater and that had for a time included the great Parliament Chamber. It was this chamber that the Lord Chamberlain’s Men had just rebuilt as a large indoor theater with which they planned to entertain the parliamentarians who would be gathering the following October, the theater that Cobham, his son-in-law Robert Cecil, and Cecil’s father, Lord Burghley, now the dominating force on the Privy Council, had ordered closed. Furious, the Company responded with rewrites of the plays in which Oldcastle, now a leading character, combined traits of Cobham, his troublesome heir and their treacherous ancestor. 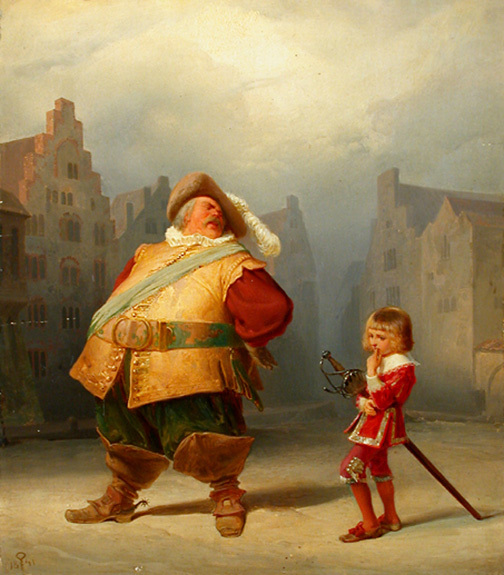 By renaming the character Falstaff, the Company may have created a disconnect with the likeness to Cobham, his ancestor, and his heir, Henry Brooke, but they did nothing to reform his character. As detailed by Scoufos, that Falstaff’s more despicable characteristics, his cowardice, his taking bribes so only the poorest and least battle-worthy recruits were taken up for the army, derive from the Oldcastle character, seems undeniable. However, there is a side to Falstaff that doesn’t seem to fit with these aspects of his character. His cowardice and lies, for instance, don’t fit with the respect inherent in Hal and Poins attentions; they tease and mock him, but something keeps them coming back. Despite his inability to live up to his promises, the women continue to support and care for him. Despite his penury and choleric temper, Bardolph, Nym and Pistol show no desire to find another patron. His craven cowardice on the battlefield doesn’t fit with his reckless courage when confronted by authority, or his contemptible lies with his monumental self-opinion. There seems to be a disconnect between his meaness on the one hand and his largeness of heart on the other (more noticable in Part Two than in Part One or Merry Wives). Such contradictions may add to our fascination when properly acted and directed, yet they raise questions about his models. Perhaps Falstaff is the result of Shakespeare’s conflation of the Oldcastle personality with yet another individual from the period. For answers we turn to historical dates and the biography of the Earl of Oxford. We know that Milord was in trouble in the early 1590s, as were his actors and all the acting companies, due to the death of Sir Francis Walsingham and the rise of Oxford’s dangerous brother-in-law, Robert Cecil. We can assume that during 1592 and ’93, Oxford was busy revising his earlier works for the benefit of a new company, the Lord Chamberlain’s Men, launched in June of 1594 under the auspices of Lord Chamberlain Henry Hunsdon. We know that the Henry IV and V plays are among the earliest of these, reformed and expanded from disassembled scenes from the extremely early Famous Victories (or perhaps later versions now lost). In seeking who might have been the first personality to transform Dericke into a modern character, the one who immediately comes to mind is the intemperate and profane Sir John Perrot. So perfectly does Perrot conform to those qualities in Falstaff that don’t fit the Oldcastle image that the identification seems without question. Perrot was a major figure at Court from his first arrival during Henry’s reign to his final quietus in the early 1590s. Tall, handsome, with the strength of a bull and the will of a lion, his likeness to the king helped strengthen the common belief that he was Henry’s byblow as reported by Sir Robert Naunton (though denied by his ODNB biographer). Since Naunton was married to Perrot’s granddaughter, he would seem to have more authority than the ODNB biographer (the author of the old DNB bio accepts Perrot’s royal patrimony.) From Perrot himself, when incarcerated and facing charges of treason, comes the quote: “God’s death! Will the queen suffer her brother to be offered up as a sacrifice to the envy of his frisking adversary?” Described by a recent academic as “a bluff, heavyset man with a reputation as a hell-raiser,” the old DNB notes that he “held various offices under Elizabeth” and “united great physical strength to a violent and artibrary disposition.” This sounds like the Falstaff beloved of Hal and Poins, of Mistress Quickly and Doll Tearsheet. Although Perrot’s holdings in Wales and his various military and naval commands frequently took him away from London, he was enough of a figure at Court during Oxford and Rutland’s time at Cecil House and later at Court for them to have played the same role with Perrot that do Hal and Poins with Falstaff. Oxford would have been attracted to Perrot for several reasons. For one, he would have been the very sort of bad example that was attracting him in his teens and worrying Burghley. For another, while in his teens, Perrot had lived for a time under the same roof with Oxford’s father, the 16th earl, so he had the kind of personal knowledge of his father that would be precious to a youth in search of an identity. When first at Court and residing with the King’s Lord Treasurer, William Paulet, Marquess of Winchester, Earl John, then in his early 30s, had been remanded into Paulet’s keeping, doubtless as punishment for his reckless treatment of his (first) wife and his finances (DNB). Then, in the early 1590s, while Oxford was suffering the slings and arrows of Robert Cecil’s rise to power, Perrot too fell victim to the Cecil roundup and destruction of their rivals. Taking seriously the complaints of Perrot’s enemies, in 1590 they saw to it that he was incarcerated in the Tower and convicted of treason, where he died in 1592 from what many believed was poison (ODNB). Thus it makes sense that in reaching for a replacement for the out-dated Dericke and other clownish characters from Famous Victories, Oxford did for Perrot what he did for his old tutor Sir Thomas (in Romeo and Juliet, Woodstock, and The Tempest), he brought his bombastic wit and defiance of authority to life for an audience that knew him very well. So which came first, Oldcastle or Perrot? Certainly it would have been Perrot, conceived in 1592 or ’93, shortly after his assassination. The character thus created was altered for the worse in 1596 when the Lord Chamberlain’s Men decided to use the Merry Wives and the Henry IV plays as a means of attacking the hated Cobham, causing the Queen to demand that the name be changed. It would have been at this time that the weight ascribed to Falstaff was added, most likely a characteristic of Lord Cobham (in the only portrait I could find he is hidden behind a phalanx of women and children). As for the Falstaff of The Merry Wives, it’s unlikely that he ever had anything of Perrot in him. Merry Wives was most likely revised in 1596, when the Company used it to satirize Cobham’s cheating and conniving and his heir’s scandalous mistreatment of the women of the Court. In questioning the source for Falstaff, a third influence can also be detected, the intrusion of the author’s own feelings and attitudes. By the 1590s, although Oxford was only in his forties, it’s clear from the Sonnets that he was beginning to feel his age. While in his twenties and thirties he would not have felt much compassion for the aging roysterer. 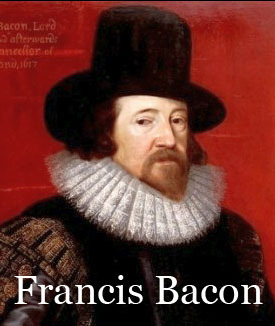 But with the loss of Fisher’s Folly and his crew of writers and secretaries in 1589, the loss of the credit that enabled him to produce plays and publish poems, even, if the evidence offered by Alan Nelson and Mark Anderson is accurate, that for at least a year or two from 1589 to 1591, before the Queen arranged for his marriage to one of her ladies in waiting, he was living in much the same circumstances as Falstaff, in an upscale boarding house in London with Julia Penn as his Mistress Quickly––he must have felt a kinship with his fallen protagonist. There’s not enough room here to detail all the factors that put these identifications beyond doubt. That will have to wait for another venue. But at the least we can assure the readers that someday, if all goes well, and a new generation of Shakespeare scholars are finally on track towards the truth, they will find the clues to these identifications thick on the trail.